The Colorado Karting Tour recognizes that getting involved in karting can be a challenge for many that are new to the sport. CKT is proud to present the leading publication “Karting 101” for the education of potential and experienced karters, respectively. It is recommended that everyone new to karting take the time to read this document, finding the sections that are relevant to their age, level of experience, and competitive ambitions. 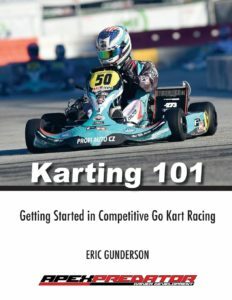 Written by national karting champion and driver coach Eric Gunderson, “Karting 101” provides newcomers with a comprehensive overview of key elements of the sport of competitive kart racing in a progressive and engaging format. Within the 100 pages of “Karting 101,” the reader will gain insight into a variety of topics, including: the basics of kart chassis dynamics, levels of karting competition, and how to take the first steps to get involved in the sport. Click Here to view Karting 101! Once you have read this document, you will likely have additional questions. Don’t forget to email us with questions about karting, or about CKT.